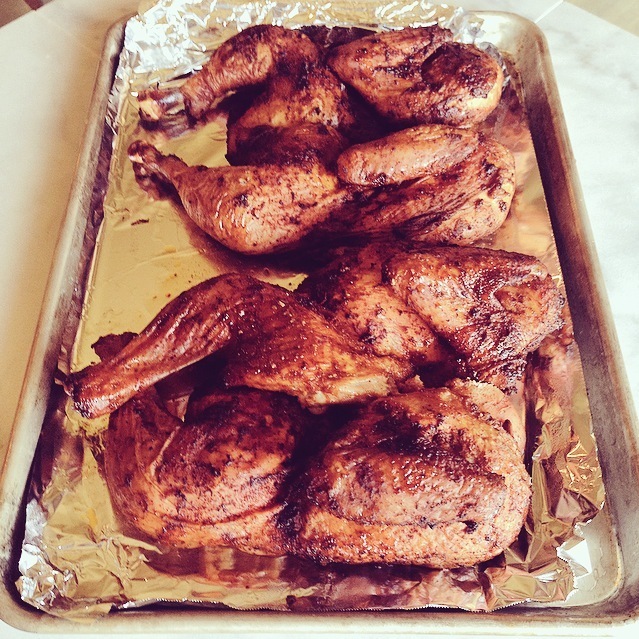 Smoked Chicken Tacos With Roasted Poblano Salsa Verde…..
Years ago I had a cute little electric smoker…. He was red and reminded me of a little Star Wars droid. I even named him R2. 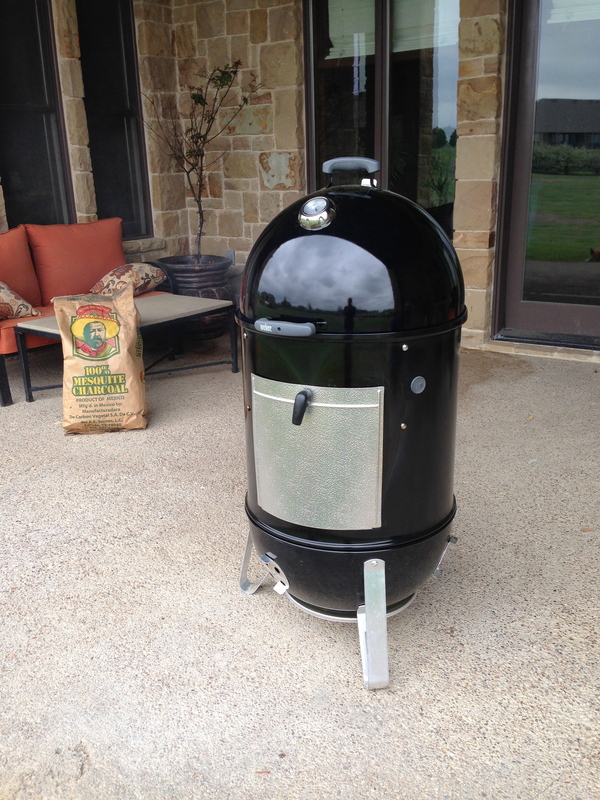 This little smoker was super easy to use and always produced tender juicy smoked meats. Sadly about 2 years ago the electric element went out and that was the end of my little “R2” smoker. About a month ago I decided it was time to replace my smoker but instead of going for the little “Droid” like electric smoker I decided on a Weber charcoal/wood smoker. This new smoker is more than twice the size of my old one at a whopping 22 inches in diameter and can cook a substantial amount of Texas sized meats. I think I will name this one Vader. One of the first things I wanted to cook on my new smoker was chicken. For the last few years I’ve depended on my local grocery store and always purchased a smoked rotisserie chicken from the deli, and while it was always good it was never as good as a true smoked chicken. So when I fire up my smoker I like to cook a couple of chickens to use throughout the week. 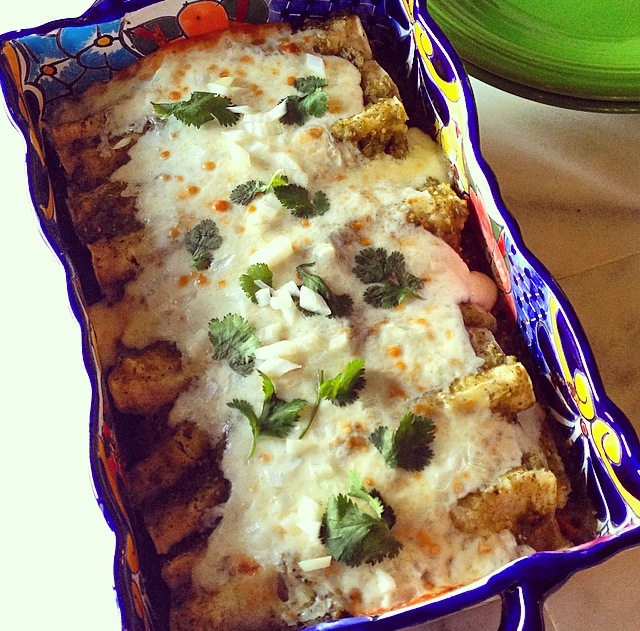 You can make countless types of Enchiladas…. 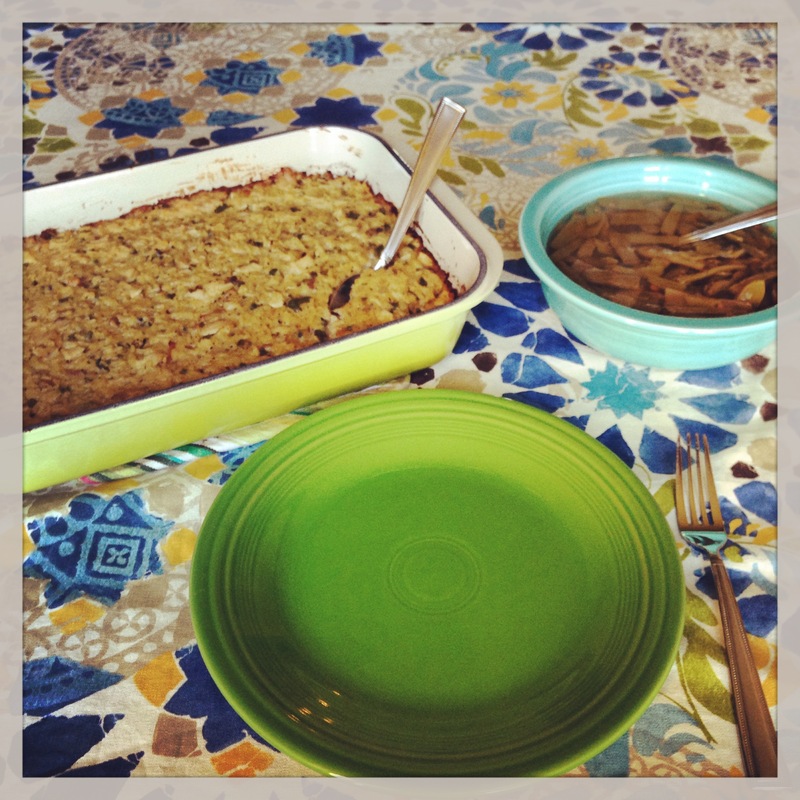 and who can forget Mom’s Chicken and Rice…. 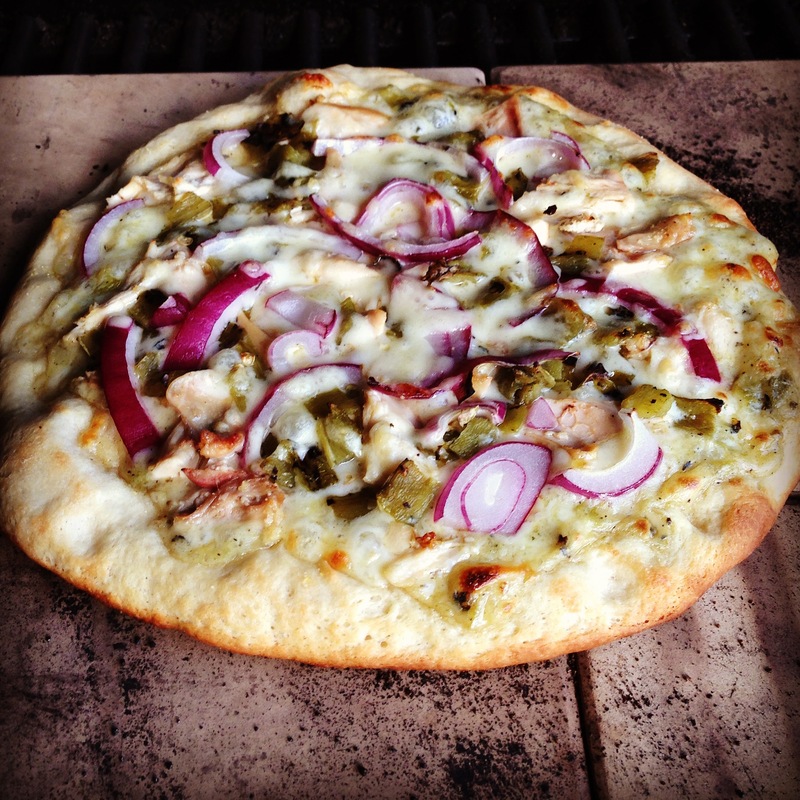 Smoked Chicken is even perfect on top of Pizzas like this Creamy Hatch Green Chile Pizza…. Yes there are countless ways to use up smoked chicken but my favorite is always in a Taco…. 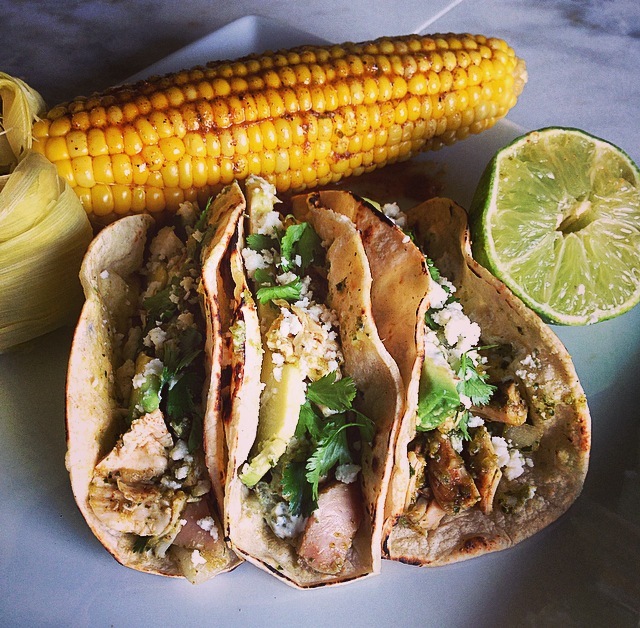 These are my Smoked Chicken Tacos With Roasted Poblano Salsa Verde served alongside smoked, sweet corn on the cob slathered in chili lime butter. I have my butcher remove backbone and breastbone (called Spatchcocking) so the birds will lay flat on the smoker and cook faster. Plus I think this also allows the smoke to really penetrate into the meat of the chicken. Measure out all the spices into a bowl and stir to combine. Then rub the spices rub all over both sides of the chickens. Cover and refrigerate over night. Remove the chickens about 1 hour before putting them on the smoker so they can come up to room temperature. Smoke according to your smoker directions. I cook my chickens between 250-300 degrees F for about 3 – 3½ hours or until the juices run clear and the thermometer reads 170. I smoke with Mesquite charcoal and small apple wood chunks. Once the chickens are done remove from the smoker and cover with foil. Allow the chickens to rest for at least 30 minutes. While the chickens are resting whip up the Roasted Poblano Salsa and prepare the toppings for the tacos. 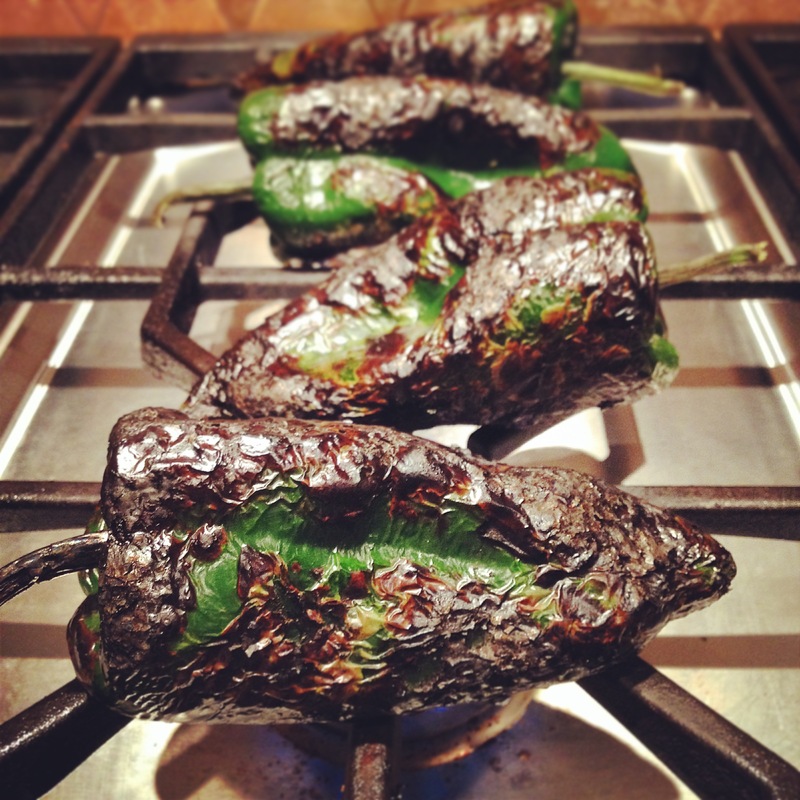 Roast the Poblano Chiles and the jalapeño under the broiler, on the grill or if you have a gas stove top directly on the burner until the peppers are blackened. Place the roasted peppers in a zip top bag and allow them to steam for 15-20 minutes. Then simply rub off the skin, and remove the stems and seeds. Place the roasted peppers, garlic, lime juice, lime zest, cumin and cilantro in the bowl of a food processor fitted with a steel blade. Puree until smooth, season with salt & black pepper (to taste) and add in the finely chopped onion. Pulse 3-4 times to combine. Shredded up 1 Smoked Chicken into small bite sized pieces and mix with half the Roasted Poblano Salsa Verde (This makes enough taco filling to feed a hungry family of 4-6. To serve set up a make your own Taco Bar with…. These Tacos are perfect served with Black Beans, Rice or even better with Smoked Corn On the Cob With Chili Lime Butter. This corn on the cob is a super easy recipe that everyone will enjoy! After you have removed the chickens from the smoker add little chunk of wood to the smoker going again. It doesn’t have to be very how we just want the smokey flavor. Meanwhile carefully peel the husks back from the corn and remove the silks. Then pull the husks back up around the ear of corn. Once the water has come to a boil turn off the heat and place the corn in the hot water. Allow the corn to sit in the hot water for 10-15 minutes. Then place the soaked ears of corn on the smoker for 20-30 minutes. While the corn is on the smoker mix together the butter, spices and the lime zest in a small bowl. Slather the hot smoked corn all over with the Chili Lime Butter. * If you don’t have the smoker going this corn can be grilled instead. Just remove the husks and the silks, put the corn in the hot water for 15 minutes, the cook the corn on the grill turning often until the corn just starts to char. The rub for the chicken sounds wonderful! Can’t wait to make this-thanks for showing other ideas for using the chicken. Getting my smoker out and prepping birds!!! Thanks Kim 🙂 I hope you enjoy! It’s a perfect time of year to get the smoker going. You will have to let me know how everything was. The kitchen is my happy place and I truly enjoy just playing with food and seeing what happens. Now if only I enjoyed doing the dishes as much as I enjoyed cooking it would be a perfect world. Mmmm…this looks perfect in every.single.way. Being from Texas myself I have all the dried ingredients, and we have a local store that carries an abundance of fresh poblanos and jalepenos year-round. I’ll have to add this to my “to make” list! We actually have two smokers. One electric for our house and a charcoal one for camping. 🙂 All your recipes listed above look delicious! I’ve started buying all these dry ingredients in bulk because I’m constantly running out of them. 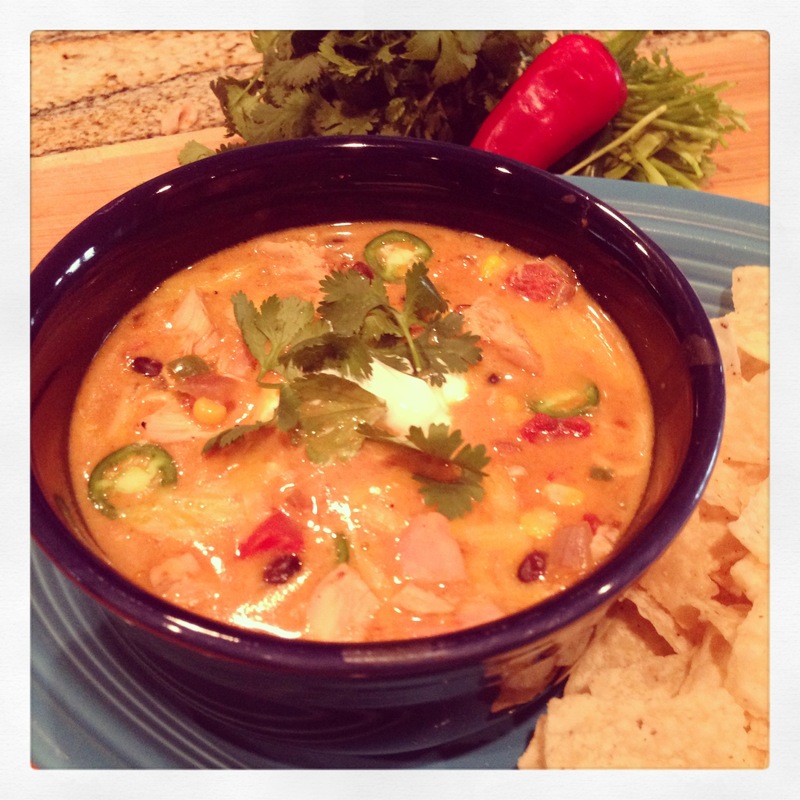 I put chili something in everything… can’t help it’s my favorite flavor. I love everything about this! My husband has a smoker and also a big green egg that acts as a smoker too. 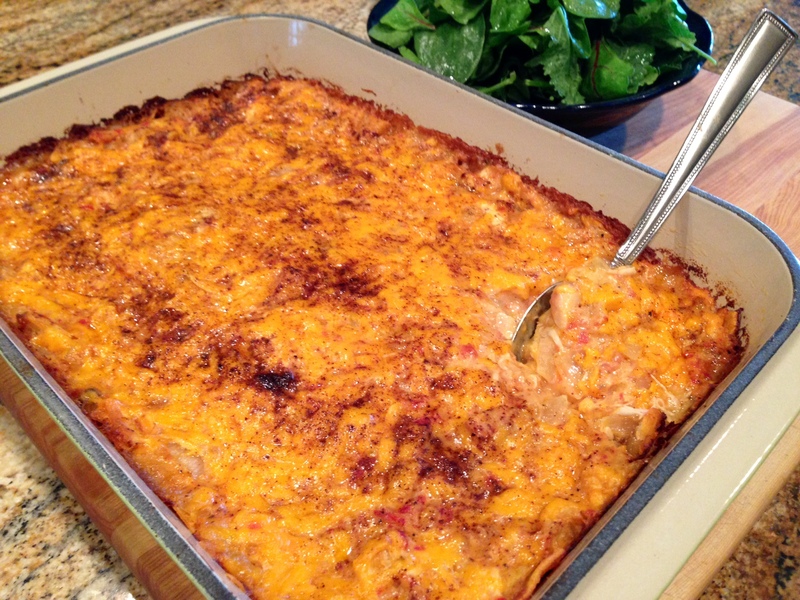 We love smoked chicken but haven’t made enchilada’s out of it. I wait for this recipe with bated breath. Until then, I will be pinning the poblano salsa. I love poblanos! I love Poblanos they are by far my favorite pepper. As for the salsa it’s highly addictive…. Chips and Salsa are my weakness and there have been many a night a meal with Mel is a bowl of chips and salsa. Oh my goodness, those pictures are making my mouth water. They all look amazingly delicious! This looks and sounds so good! No fresh poblanos here unfortunately, so I may have to substitute with a mix of green bell peppers and more jalapeños to compensate. I have a ‘barrel’ grill/smoker from Texas that I have yet to try it for smoking, so I will try to prepare something similar to this. It’s always a good feeling when the weather becomes nice enough to get the smoker out isn’t? Maybe you could take some of the seeds from your dried ancho chilies and grow your own Poblanos 🙂 This would take doing everything from scratch to a whole new level. Oh wow! This looks so delicious! I will definitely be trying this out! Definitely would make these with a fresh margarita! 🙂 A cook after my own heart!! Sounds like we need to figure out how to have some kind of online “Margarita Happy Hour.” Tell’em Tuesdays Margarita’s?? There is a wonderful margarita recipe on Tell’em Tuesdays today! Mmm I envy Vader- I haven’t invested in a smoker yet but the flavor they give food is incredible! Thanks for sharing at ‘Tell em Tuesday’! Those tacos look great, but that corn is what’s really calling my name! YUM! This looks so, so good. But I’m wondering about where in the world you got your metal tray that is underneath your gas burners on the stovetop??? That looks so helpful for cleanup time!! My stovetop looks horrid most of the time. Then I clean it, and it’s clean for about an hour. Then I have to work up the oomph to go to it again in the next couple of days. lol!